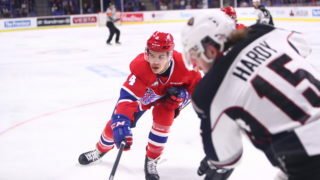 The Spokane Chiefs saw their modest two game win streak come to an end Sunday night as the Everett Silvertips held off Spokane 5-3 in Everett. Former Chief Dominic Zwerger led the Silvertips with two goals and one assist in the Everett win. Zwerger got Everett on the board with a goal just 3:14 into the game as the Silvertips led 1-0 after one. Zwerger would add his second of the night 1:27 into the second period to extend Everett’s lead to 2-0. 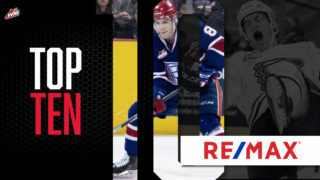 The Chiefs’ Jaret Anderson-Dolan would cut the lead in half with his 15th goal of the season on a feed from Taylor Ross at 4:25 to make it a 2-1 contest. Everett’s Graham Miller would score at 9:43 to put the Tips ahead 3-1, and the Chiefs would lift goalie Jayden Sittler for Dawson Weatherill. 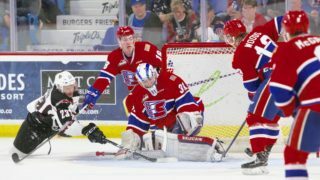 Spokane would narrow the gap to one once again as Anderson-Dolan scored his second of the night, and 6th goal in 4 games, at 10:25 to make it a 3-2 game after two. The Silvertips would get their second power play goal of the game 3:44 into the third to go back ahead by 2 at 4-2. The Chiefs Keanu Yamamoto took a Hudson Elyniuk pass and scored his 13th of the year at 7:47 to bring Spokane back within 4-3. The goal extended Yamamoto’s point streak to 12-straight games. 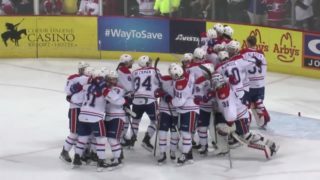 The Chiefs would not be able to come any closer though as Everett scored an empty net goal with 1:03 remaining to wrap up a 5-3 victory. 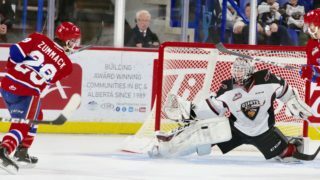 The Chiefs and Silvertips put up 27 shots apiece, while the Chiefs power play went 0-2 and the penalty kill was 2-4. Spokane has now given up 2 or more power play goals a game in their last 5 contests. 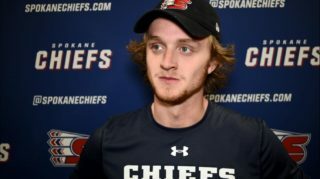 The Chiefs and Silvertips season series is now 2-2 in the 8 game series. Spokane will finish off their 3 game road trip Tuesday night in Seattle at 7:05 p.m. against the Thunderbirds. Mike Boyle will have the call on 1510 KGA starting with the pre-game show at 6:30 p.m.